It seemed like a good time to climb Cannon again. My last climb of this peak had been way back in 2004, when Muffin and I climbed via the Kinsman Ridge Trail from the Cannon Mountain Tramway parking lot. Also, I hadn't climbed anything in the winter for awhile, and Cannon wouldn't be as challenging as some of the higher and more remote peaks. Finally, the ski area was open and I would be able to stop in, warm up, and get something at the snack bar on the summit. I felt good about my choice. Actually, my first destination was Lonesome Lake Hut, another spot that I hadn't been to in awhile. 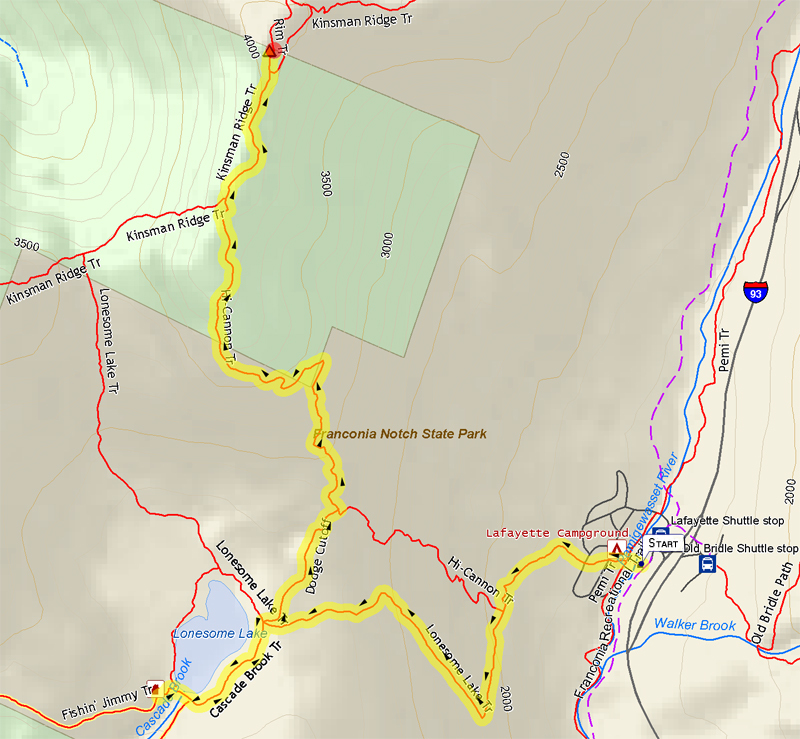 Parking at the State Park, I started up the familiar Lonesome Lake Trail. It had been a snowy winter; and on top of that, it had snowed a few inches during the night. I wasted no time in putting on my snowshoes. 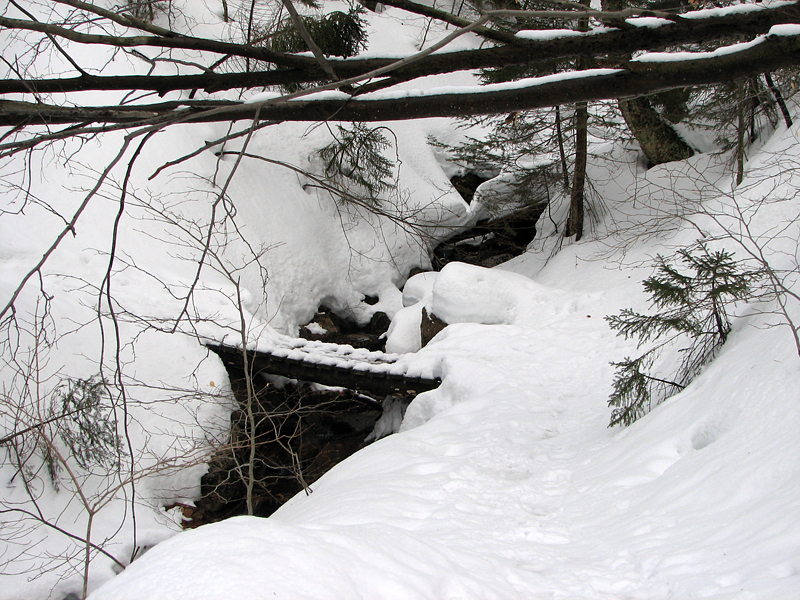 Although the trail was fairly well packed, it was also a bit slippery, and the snowshoes provided much needed traction. 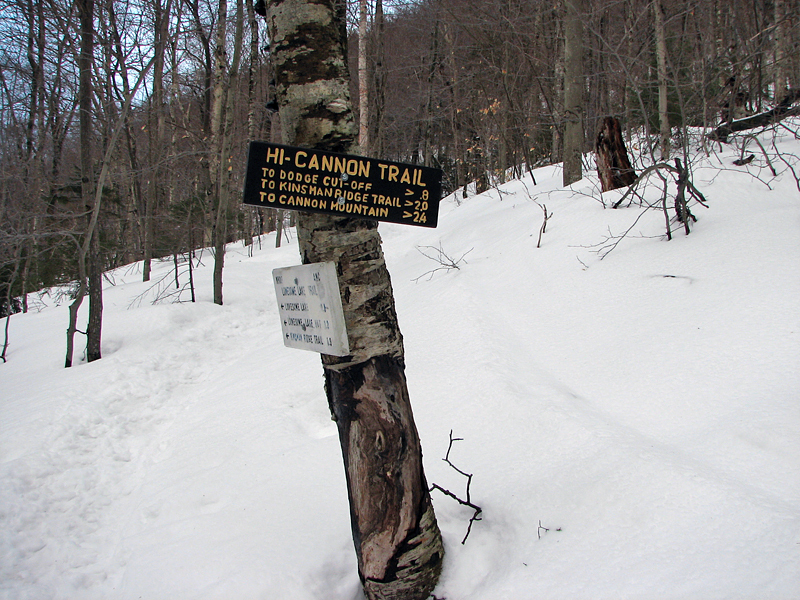 It was nice being in the mountains again, and on the first White Mountain Trail that I had ever hiked. It was an old familiar friend, and I knew every twist and turn. 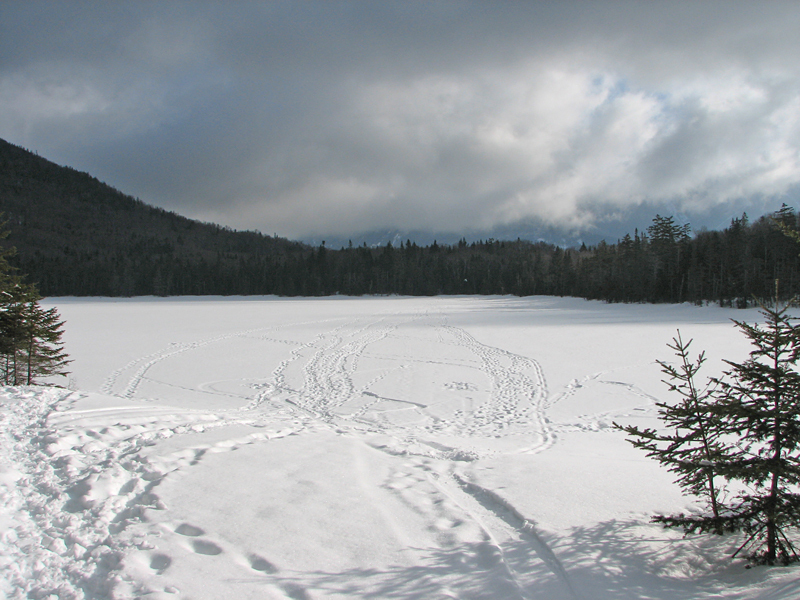 I made it to the shores of Lonesome Lake in reasonable time, stopping to look over its snowy surface toward the hut on the other side. There were tracks on the lake, and I considered taking a shortcut over the lake instead of the longer route on the trail, but then decided it might be better to check with the hut caretaker and get his opinion on the safety of the ice before trying it myself. 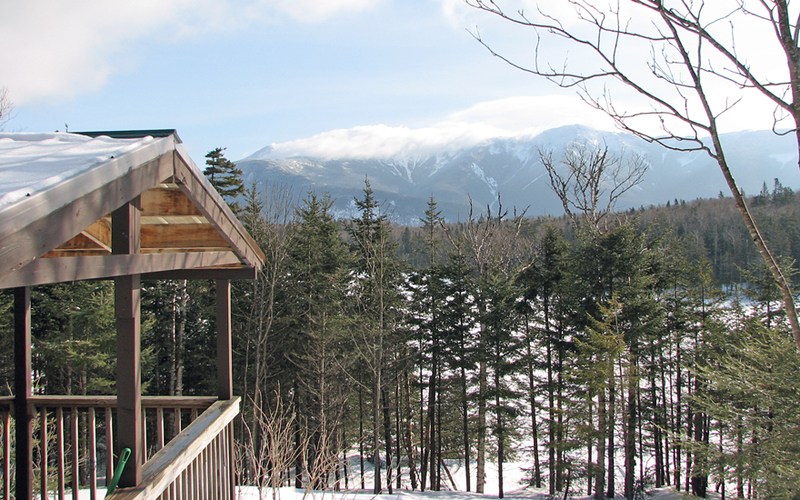 The snow was fairly deep and not quite broken out on the Cascade Brook Trail around the east shore, but I soon crossed over the lake's outflow and stood looking over at cloud-obscured Franconia Ridge from the hut's beach/dock area. Off to my left, even the nearby bulk of North Cannonball stood stark and cold, struggling to peak through wisps of somber fog. At the hut, all was bright, warm, and welcoming. The stove was lit, and the caretaker stood chatting with a couple of hikers would had stayed there overnight and were now headed up to the Kinsmans on the Fishin' Jimmy Trail. Other than the weather and the conditions of the nearby trails (and safety of crossing over the lake), the main topic of conversation was the earthquake and tsunami that had hit Japan less than a week before. In fact, one of the other hikers had been in Japan just before the disaster hit. After resting for ten or fifteen minutes, I headed over to check out the bunkrooms, which I had been told were completely remodeled. I was amazed at the vast improvement. The last time I had been in one, the walls had been paper-thin and full of small knot holes. Now, I'd actually consider staying there again. 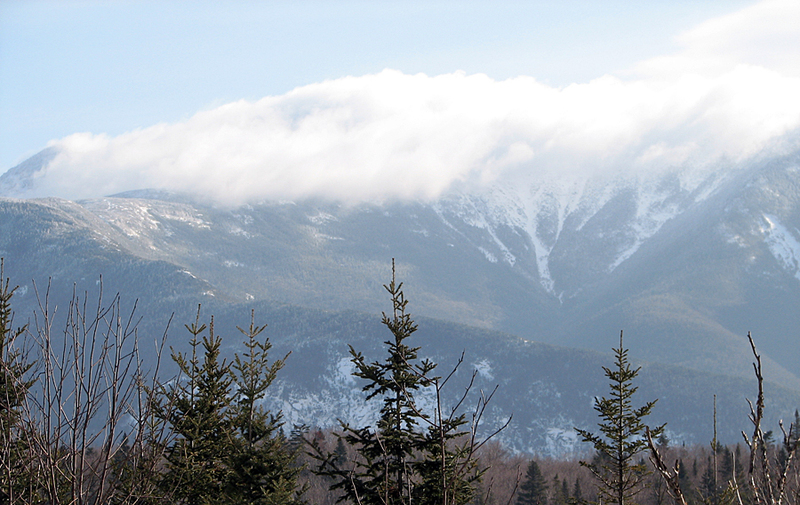 On my way out, I got another look at Franconia Ridge, which was just beginning to clear. Agony Ridge, the route of the Old Bridle Path, was now partially in the sun, as were most of the lower portions of the range. Only the summit cones still lay behind thick drifting clouds. The day was beginning to clear up! Trailhead sign. As you can see, the snow was still fairly deep, even down low in the Notch. First bridge on the Lonesome Lake Trail. 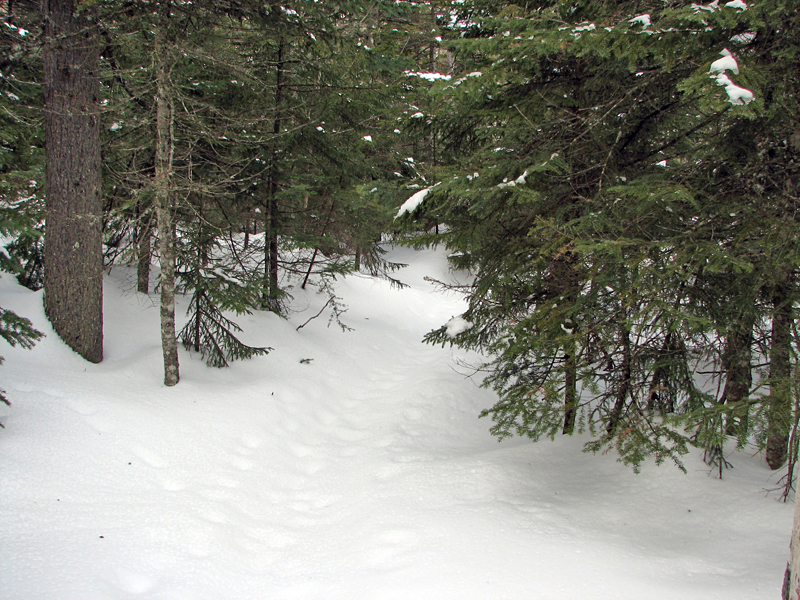 Although the trail was mostly packed, I wore my snowshoes from the start to help increase traction. Hi-Cannon Trail Junction. 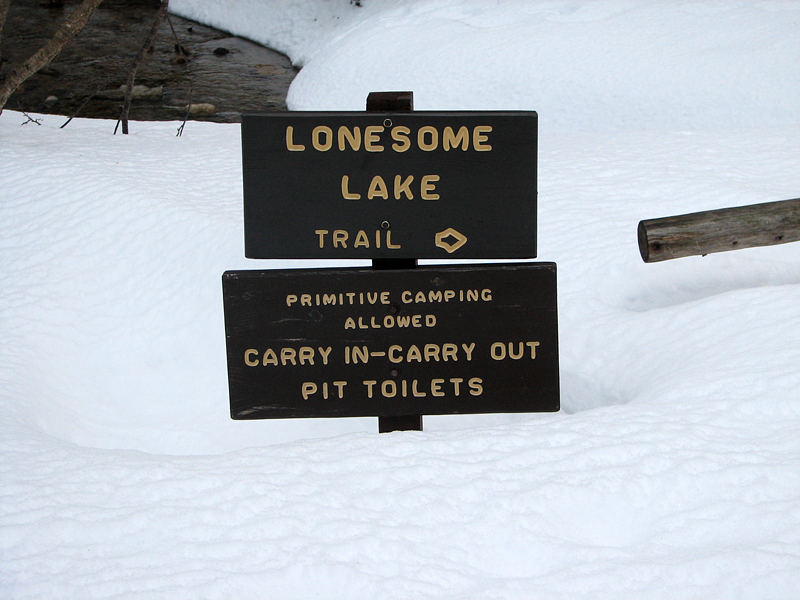 I could have turned off here, but I wanted to go to Lonesome Lake Hut first. Lonesome Lake Trail. Down low, there were a couple of inches of new snow on top of all the old packed snow, increasing to maybe four or five inches higher up. View from the Lonesome Lake Hut beach/dock area. The clouds in the distance hide Franconia Ridge. North Cannonball. 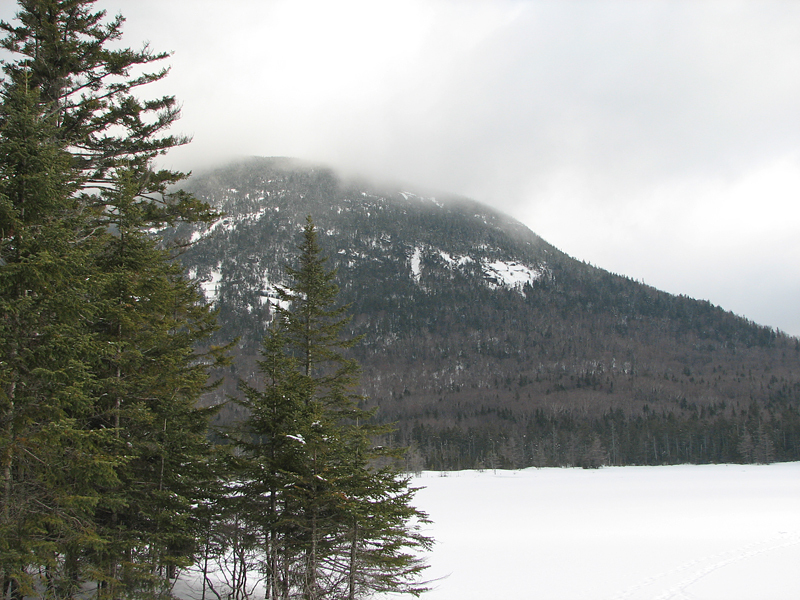 Rising directly above the western shores of Lonesome Lake, North Cannonball is one of the New England Hundred Highest. 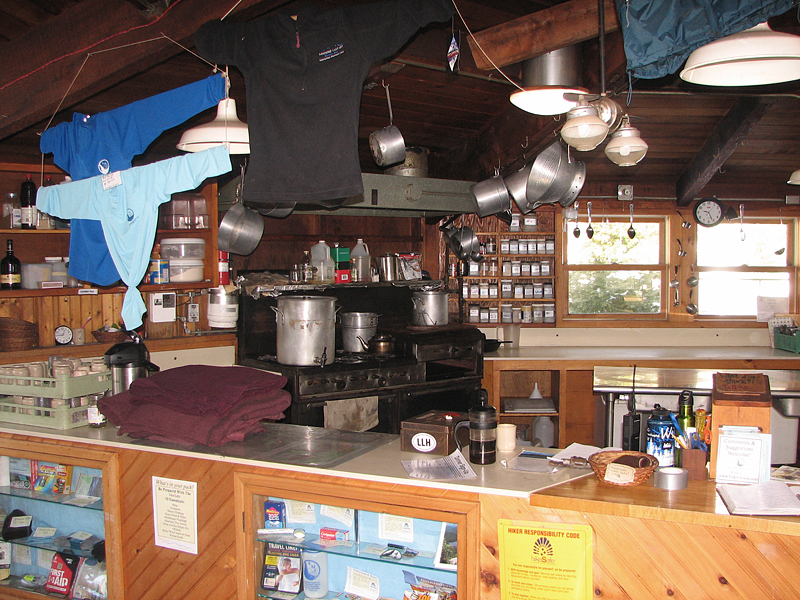 Lonesome Lake Hut kitchen. Besides the winter caretaker, there were a couple of overnight guests. 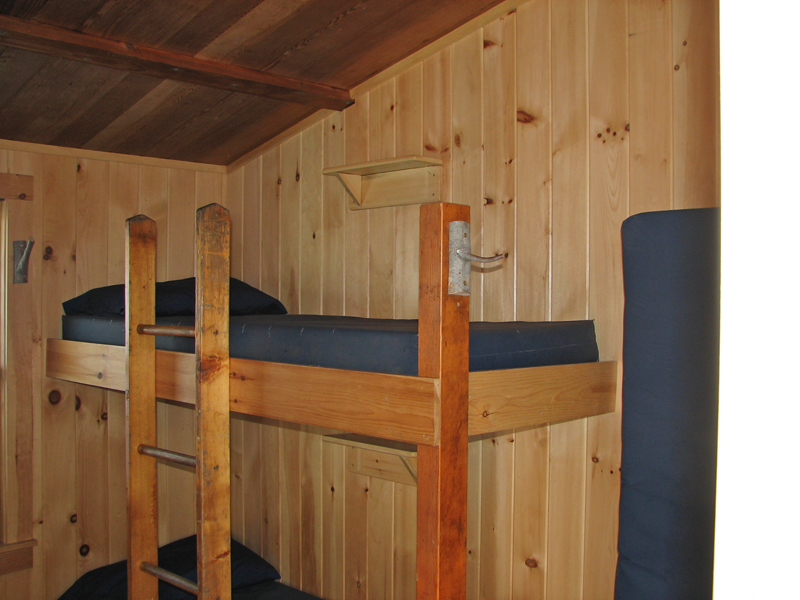 Newly-remodeled bunk room. The walls in Lonesome Lake's bunkroom used to be paper-thin and full of small knot holes. This was a vast improvement. Closeup of Franconia Ridge. The summit of Mt Lafayette is hidden behind the clouds in the center of the picture. Agony Ridge and (the also hidden) Greenleaf Hut are at the left.